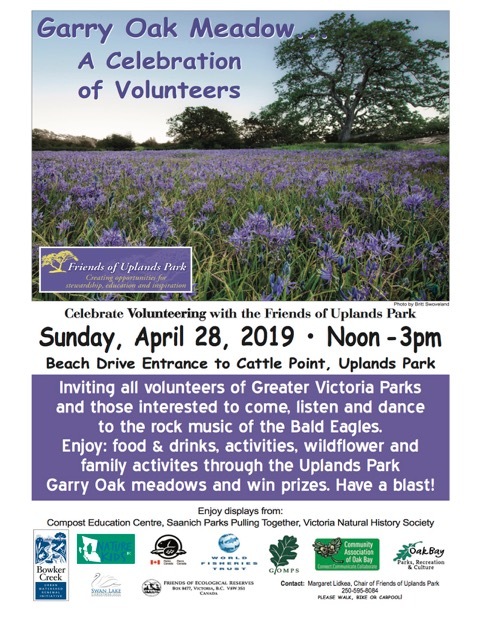 “Garry Oak Meadow – A Celebration of Volunteers.” Sunday April 28, 2019. Noon – 3:00PM. Uplands Park. Celebrate Volunteering with the Friends of Uplands Park. Beach Drive entrance to Cattle Point, Uplands Park. Inviting all volunteers of Greater Victoria Parks and those interested, to come, listen and dance to the rock music of the Bald Eagles. Enjoy food & drinks, activities, wildflower and family activities though the Uplands Park Garry Oak meadows and win prizes. Hosted by Friends of Uplands Park with displays and activities by GOMPS, Compost Education Centre, Saanich Parks Pulling Together, Swan Lake, Nature Kids, Friends of Ecological Reserves, World Fisheries Trust, Community Association of Oak Bay, Victoria Natural History Society, Oak Bay Parks and Recreation and others.